Uniquely formulated shampoo for pets with fine hair and less dense coats that optimizes cleaning, conditioning and rinsing for a healthier clean. With its innovative foaming spray applicator, FoamCare is applied evenly with less mess—simply from the squeeze of a trigger. It’s the new easy on, easy off shampoo that makes bathing pets more fun with less stress! 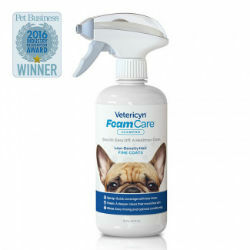 Easy on and Easy off, for a healthier clean– saves you time and nourishes the skin and coat while leaving your pet with a clean scent. Non-irritating, pH optimized, and retains essential skin oils.